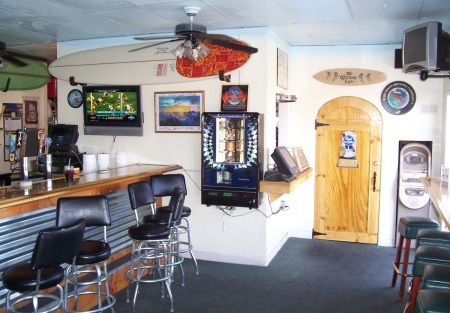 Selling Restaurants presents this excellent opportunity to own a sports bar near the water. The sales are strong and growing with lots of condo/ time share construction going on within walking distance. Kitchen and front of the house remodeled in 2007. All equipment in great condition. Lots of locals (bikers, walkers, boaters, and beach goers) and tourists. Time share condos and hotels within walking distance. Fully equipped kitchen with hood. Great floor and bar area which seats approximately 46 people. View a TV from any seat while you enjoy a burger and a cold one. Type 41 beer and wine license. Karaoke on special nights makes it standing room only. This 1241 square foot gold mine is easy to run as an owner operator. Take the next step and select the bright orange buttons for the address and more pictures below. Register if you are a new buyer and then get the name and address by agreeing to the confidential agreement. This will also place you on our exclusive buyers email list. Revenues & Incomes are Annualized. Business Opened in June 2007.